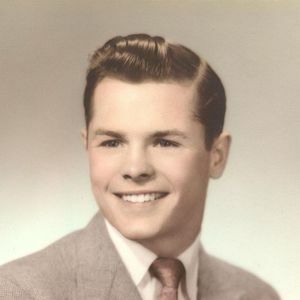 James P. "Jim" Donnelly, Jr. Your inquiry has been forwarded to Eaton & Mackay Funeral Home . James Peter Donnelly Jr. passed peacefully, in his home, surrounded by family on May 1, 2012. James "Jimmy" was born on November 25, 1935 in Boston, and raised in Newton. He graduated from Newton High School and went on to serve proudly in the United States Army. Upon his return to the states, he went to work for New England Telephone. He spent the rest of his career in the phone business, retiring from the MIT campus in 2009. Jimmy loved the water, spending his formative years sailing and cruising the Charles River and points Down East. He never met a fishing pole or a cup of coffee he didn't like. Quick with a smile, and always willing to lend a hand, Jimmy will be missed by many. Son of the late James P. Sr. and Emily (Howard) Donnelly he is survived by his brother Tracy "Tim" Donnelly and his wife Carol of Rockport ME, his sister Margaret "Peggy" Monbouquette of Newton and was brother of the late Kerry Donnelly. He is also survived by his aunt Nancy Howard of Newton, 5 nieces and nephews as well as 12 grandnieces and grandnephews and many loving cousins. His funeral will be from the Eaton & Mackay Funeral Home 465 Centre St. NEWTON CORNER on Fri May 4 at 9:30 AM followed by a Mass of Christian Burial in Our Lady Help of Christians Church at 10:30 AM. Relatives and friends are kindly invited. Visiting hours are Thurs 4-8 PM. Interment is private. In lieu of flowers memorials may be made in his name to VNA Care Network & Hospice 120 Thomas St. Worcester, MA 01608. Our knight in shining armor that would never wear the armor. You will be so very missed by so many. I remember the late 40's and early 50's fondly, Jimmy, Timmy and I, Jackie, with Nickie the Sheepdog. We were like the "Little Rascals" in a little mischief, sometimes directed at me! And there was beloved Sister and Cousin, Peggy giggling on the sideline as we played. very giving in all ways. He was the glue that held the families together. In loving Memory of you Jimmy, you will be in my memory always. May we all be as Blessed and Loved as you have been,, in life and in passing. Please watch over us. I wish we had spent more time together in our golden years. Memory book message already provided with my sisiter, Claire Marie Petka. Sometimes it's difficult to express our thoughts at a time like this. Both Don & I just want somehow to let you know that you will always remain in our hearts & memories--the happy times of our youth. Never have either of us ever met a man as unselfish & devoted to his family as you. Both you & Tim were our big brothers (even though we never told you) & we still feel the same way. God keep you safe.